If you weren't a kid when you first saw Space Jam, you're a lot less likely to find it palatable. 87 min. Warner Brothers. Director: Joe Pytka. Cast: Michael Jordan, Wayne Knight, Theresa Randle, Manner Washington, Eric D. Gordon, Bill Murray, Danny DeVito. It's tempting just to call the 1996 kiddie comedy Space Jam some kind of abomination and be done with it, but I'm aware of how beloved the film is to the generation that grew up on it. Space Jam was a little after my time in that respect, which means I grew up on a steady diet of the original Looney Tunes cartoons, aired on Saturday mornings. The two aren't necessarily mutually exclusive, but if you weren't a kid when you first saw Space Jam, you're a lot less likely to find it palatable. The idea behind Space Jam is simple: to resuscitate the Looney Tunes characters in a big way—and on the back of Robert Zemeckis' 1988 hit live-action-animation hybrid Who Framed Roger Rabbit—by pairing the likes of Bugs Bunny and Daffy Duck with Michael Jordan. Well, what could go wrong with such an intuitive, artistically pure concept? Space Jam proposes a similar universe to that of Roger Rabbit, in that it envisions the Looney Tunes gang as essentially being a bunch of actors who live pretty much in harmony in their underground animated world, when not appearing in Warner Brothers shorts. Up top, basketball superstar Michael Jordan announces his retirement from the game to pursue his long-held dream (on behalf of his father) to play professional baseball (that plan doesn't go so well, and big ups to Jordan for taking it on the chin there). All heck breaks loose when outer-space amusement park Moron Mountain sends dimwitted emissaries called the Nerdlucks to round up marquee entertainers. When they target Bugs and pals for interstellar relocation, Bugs negotiates a winner-take-all basketball game with the aliens, reasoning they'll be clumsy on the court. Instead, the Nerdlucks magically steal the b-ball skills of cameo players Charles Barkley, Patrick Ewing, Muggsy Bogues, Larry Johnson and Shawn Bradley, forcing the "Tune Squad" to kidnap Michael Jordan as their ringer. Obviously, all of this is a far cry from the tone and form of the original Warner shorts, so there's no reason for the filmmakers to stop here. It's on to roping in an unbilled Bill Murray (as himself), who leaves buddy Larry Bird on the golf course to pursue his own dream of playing high-stakes hoops. And so it goes. Purists will not find the Looney Tunes characters to be as flexible as Warner does (and when the characters are given anything of note to do, it can be out of character, traditionally speaking). Still, voice actors Billy West (as Bugs and Elmer Fudd), Dee Bradley Baker (as Daffy Duck and the Tasmanian Devil, Bob Bergen (as Marvin the Martian, Porky Pig, and Tweety), Bill Farmer (as Sylvester, Yosemite Sam, and Foghorn Leghorn) and Maurice LaMarche (as Pepé Le Pew) perform admirably under the circumstances (collectively carrying the weight of the late, great voice artist Mel Blanc). As for Michael Jordan, he's suprisingly game (pun intended) and, though Robert De Niro has no need to watch his back, more than adequate holding the film's heroic center. All in all, kids will thrill to the eye-popping visual mania that is the film's stock in trade. 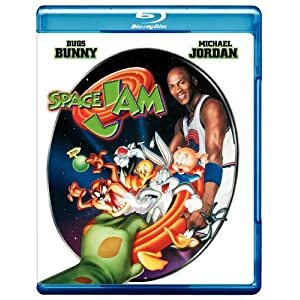 One can't expect the fifteen-year-old blend of live action and animation that is Space Jam to look razor-sharp, but Warner's Blu-ray looks as good as can be expected, which is a darn sight better than the DVD. Live-action footage holds up best, though it can be inconsistent: details and textures noticeably improve, on the whole. The animation scenes succumb at times to jaggies and the like, but they're endemic to the source material. Sound proves less problematic, with a DTS-HD Master Audio 5.1 mix that provides excellent service to the dynamic sound effects and pop music that are such important elements of the film. The previously available bonus features mostly return, beginning with the audio commentary "by Bugs, Daffy, and director Joe Pytka" that actually features Billy West and Dee Bradley Baker (Bugs and Daffy's vocalists) more than their characters. West and Baker are amiable and informative about the voice-acting process and the unique demands of this film, and Pytka, recorded separately pops up with regularity to offer his director's perspective on the project and the production. 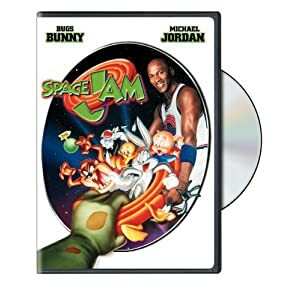 The 1996 promotional TV documentary "Jammin’ With Bugs Bunny And Michael Jordan" (22:33, SD) features film clips, behind-the-scenes glimpses and brief interview clips of Pytka, producer Ivan Reitman, Michael Jordan, composer James Newton Howard, and Chuck JonesDuck, and 1991’s Invasion Of The Bunny Snatchers. Classics these ain’t, but they do have their moments. Living Duck has Daffy voiced by Mel Torme, so if that sounds interesting, check it out. Invasion has been edited by almost 3 full minutes, though, leaving out all the Yosemite Sam segments. I have no idea why, except that perhaps this was accidentally taken from a print that had simply been edited for time for whatever reason. Also here are two music videos, Seal’s "Fly Like An Eagle" and "Monstars Anthem: Hit ‘em High," as well as the film's trailer. All site content © 2000-2019 Peter Canavese. Page generated at 04/24/2019 06:56:37AM.